[S385] 1861 England Census, Yorkshire County, Ecclesall Bierlow, England, GSU Roll 543137. [S383] 1871 England Census, Yorkshire County, Norton, England, GSU Roll 847223. [S385] 1861 England Census, Yorkshire County, Ecclesall Bierlow, England, GSU Roll 543137, shows the son of Frederick Baker as Frederick Baker. [S383] 1871 England Census, Yorkshire County, Norton, England, GSU Roll 847223, shows the son of Frederick Baker as Frederick Baker. [S385] 1861 England Census, Yorkshire County, Ecclesall Bierlow, England, GSU Roll 543137, shows mother as Louisa Baker. [S385] 1861 England Census, Yorkshire County, Ecclesall Bierlow, England, GSU Roll 543137, shows age 8 and birthplace as Sheffield, Yorkshire. [S383] 1871 England Census, Yorkshire County, Norton, England, GSU Roll 847223, shows age 19 and birthplace as Sheffield, Yorkshire. 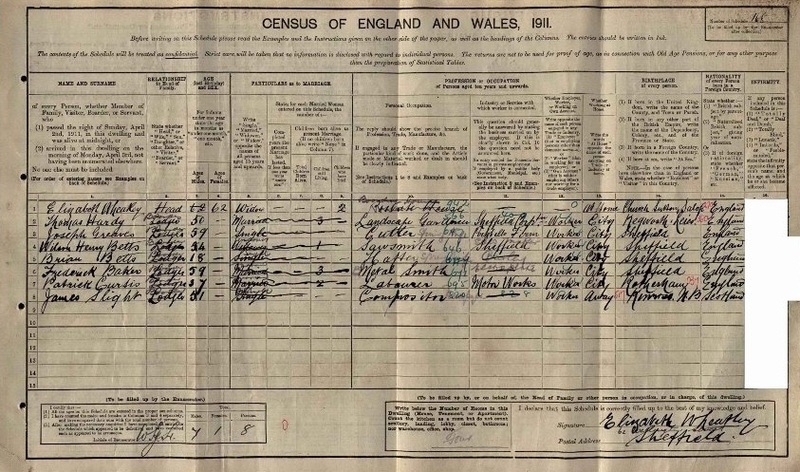 [S938] 1911 England Census, Yorkshire County, Sheffield, England.